Dental implants not only effectively and reliably replace missing teeth, but also help prevent the loss of jawbone density, prevent shifting of the adjacent teeth, restore the support of facial structures, and provide you with the support you need to effectively use your teeth. The procedure for dental implants can be a quick and easy, and in some cases, can be done in a single day; sometimes referred to as: “Immediate Implants”. Dr. Massoomi has published multiple papers on the use of “immediate implants”, especially in the esthetic zone. Implants become part of you, so they eliminate the discomfort of removable dentures. They also prevent the embarrassment of removing dentures at every snack or meal, as well as the need for denture adhesives. Dental implants are very durable, lasting several years to decades, and if they are in good care, can last a lifetime. Get your smile back and feel better about yourself! 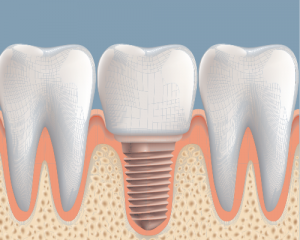 Dr. Massoomi specializes in using the latest techniques for dental implants. We promise you will not be disappointed.